* if you see something that you like, or even think you like, pick it up. You can always think about it and set it down later. You'll be kicking yourself if you don't and see someone else pick it up and then it will make you like it even more. :) If it's a big item, start asking questions about it and then if you want it, tell them you'll take it and it's yours! (yes, you still have to pay) If you want to discuss it with your husband first, let them know you think you want it, you just have to make a phone call first. *If your arms are getting full, ask the people running the sale if you can make a pile by them. That way, they know it's yours and by the yard sale "rules", no one can take stuff from your pile. I hate it when I see something I love and pick it up and someone says, "oh, that's my pile." But, you have to be nice and play by the yard sale rules. Piles are sacred. If they're asking $10, ask if they'll take $7. If it's $5, ask if they'll take $3. What's the worst they can say? Then you decide if you want it at that price or not. If you have more than a couple of items, add it all up in your head and then take off what you think sounds fair and then ask. Don't low-ball though. You don't ask for a pile of amazing stuff that adds up to $10 for one dollar. That's bad yard sale etiquette. Sometimes, people just have great prices and you don't feel like you need to ask for less. Another trick for this one: I've found it helps if I have the cash in hand when I ask. So, if it's $10, I'll pull out a five and two ones and say, will you take $7 for it? For some reason, when the money is right there, they seem much more willing to take it. A funny story with this one: when I was with my sister-in-law Kristine we were at the end of our yard sale trail and out of money. There was something she really wanted though, so we went and searched through the car for some loose change, and we came up with .42 or something. 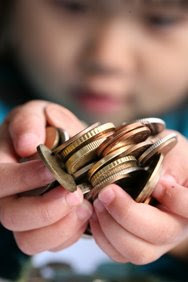 She went up like a little kid and showed him all the loose change and said, will you take .42 for it? He just took pity on her and just gave it to her. Oh, the good yard sale memories. You'll come across sales that are just so high priced it's crazy. You can feel them out to see if they're willing to come down, but most of the time, I just move on to the next one and don't waste my time. speaking of prices, I have "price points" set in my head of what I want to spend for certain items. For example, I try not to spend more than 50 cents a piece for kids clothes, unless they are coats, dresses, nice shoes, or very nice name brand items. The more you go, the more you'll have little price points in your head for what you're willing to pay for items. if there is something that's priced too high and they won't come down, or an item I need to go home and measure to see if it will work, I ask for their phone number and then I can call them back and say, "I want it~can you hold it for 10 minutes until I get there?" Or, you can call in the afternoon to see if they still have it. Most people are much more willing to go down in price if it's the end of the day and it's still there. Sometimes you can tell it's just not your kind of sale when you drive by and you just move on to the next one. If you do walk up and nothing catches your eye, just say, "thanks" or "have a good day" and be on your way. many times, people will ask if you're looking for anything in particular. If you are, tell them. This last fall when I was on the hunt for maternity clothes, I asked and a lady brought out 2 whole boxes she forgot. 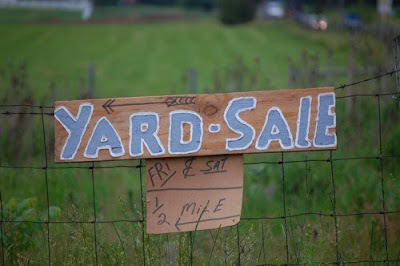 Tomorrow, we'll wrap up our little Yard Sale 101 Series with "after the sale" and some miscellaneous tips that I forgot. I'd love to hear any other tips you have! Talking about Dept. Store prices. My sister just comments that, "They're too proud of their stuff." :) And it's true. It's a yard sale people. Want to get more...put it on Ebay, not your lawn. :) Thanks for all the great tips. I'm so glad that garage sale season is here. Love your tips. Look forward to seeing all of the great finds everyone will get this season. I had to laugh at the "asking the husband bit" for the price, you are so right though. Husbands usually don't have an emotional attachment to stuff. It so works. Great ideas. I'm pumped to go out this weekend. In California, it is always the season, so I have to learn to say no to myself-sometimes. 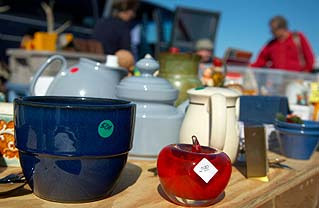 Truly, tips from the best garage saler of all time--I love it! That 42 cents did the trick--one of the best stories ever! I feel honored to be mentioned in one of your posts! :) Love you! I need to go on a hunt now... I'm practically craving a garage sale! I had a garage sale last time I moved and I totally agree with what you said- when they have the money in their hand you're much more apt to take it, even if they're offering less than the asking price. I was really mad once, this lady came up with a couple of books in her hand and said she'd pay some amount for the whole stack, I said fine. Then she picked up a suitcase ad something else and off she went. I was so shocked and mad (and back then too afraid to stick up for myself) that I couldn't even chase her down and say anything. So, I agree- don't low ball people! I love your last tip about "ask the husband". Isn't that the truth. I am always willing to bargain with shoppers because if I have gone to all of the trouble of putting it out there the last thing I want to do is haul it inside. 50 cents is better than nothing in my opinion but on the same note low balling is just not good etiquette. I have actually had people steal from me at a church garage sale. All I could think was that one is between them and God. Great tips Melissa. You are such a good little bargain hunter! I totally have the price point thing in my head for thrift store or garage sale shopping. I know the drive by is okay, and I do it, but it's funny...when I've had garage sales and someone drives by w/o stopping, I always kind of think 'what's wrong with my stuff? my junk is great!'. And an unrelated question...when you made the little onesie with the star...which mkbat letter or symbol makes the star? Those are some really great and practical tips. 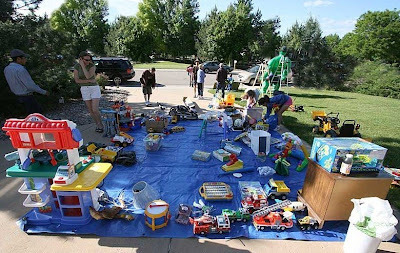 Thanks for sharing, I can't wait until garage sale season starts here! I've always wanted to be one of those people who can find treasures at yard sales. I think this might be my summer! Another tip I've heard is if you go to a particularly good yard sale, especially if the person seems to have the same taste or clothing that fits you or your kids, leave your phone number with them. Next year when they're cleaning out their closets, tell them to give you a call. Then you can have first dibs on stuff you know you're going to like. They may not go for it, but they may. And like you said, it doesn't hurt to ask! Thanks for all the great tips! I usually go to one or two and can't find anything, so I just give up and go back to bed. Maybe this year will be the year! :) Where in Texas are you from? Jennifer~I love the tip about finding great sales and getting their number for next time! Holly~I've been in that same position as a seller when peopel drive by and then drive on~you just want to yell, "you don't know what you're missing!!" Juli & Amy~that is just sad, but it's happened to us before too! I had to laugh about the Department Store prices because here in Ontario, it seems like that's all people offer! I hit a sale last year where a woman was selling a broken laundry basket (it was cracked) for $5. And a toy chest (plastic) covered in crayons for $10. Silly!! I even had to laugh as I've seen sales start at 10:30 am. Different strokes for different folks I guess. Okay, I am totally cracking up with your last suggestion! Today I went with my husband and daughter and I happened upon 6 throw pillows, Waverly red gingham, I asked the husband and he said, " I guess a $1) seriously. I bought them all. I mentioned to my husband that his wife must have just stepped inside.